Another one of the most notable things is that everything is extremely casual, for better or worse. This can mean, say, that you get to camp by the river bank in a campground for free but it can also mean that the long-neglected showers in that campground have so many bugs and spiderwebs in them they feel like a haunted house and you’re stomping on beetles while you’re trying to wash your hair. Also, as most people know the South has quite a bit of poverty. A lot of towns we’ve come to have, for a variety of complicated reasons, seen better days. The owner of Hickman, KY’s Miss Martha’s restaurant explained to us how Hickman’s center used to be bustling but now most buildings lie empty and/or in disrepair. Many towns we’ve been through have trouble rebuilding downtown business sectors while Dollar Generals, gas stations and liquor stores thrive on the outskirts for a variety of complicated reasons that would take more than just this blog post to explore. Hickman fit this pattern. Regardless, there’s not been one person we’ve met so far in the north or south who has made us uncomfortable or worried about your safety. Not that there aren’t bad people out there but we didn’t run into them north of Mason-Dixon line and we’ve yet to run into them south of it. And racism. So far on this trip there have been three instances of uncomfortably racist comments. The worst took place, as most of our northern friends would have predicted, here in Mississippi, when a man we met started to philosophize about how, to paraphrase, there are some people in this area who just can’t hold down a job with complicated tasks, how in the ’50s when “we were supposedly so mean to them,” at least back then they “were being taken care of.” You can infer who “they” are. Where do you even begin? A lot of people would hear that story and feel every assumption they’d made about the South was confirmed. But then on the other hand, the woman we met who indignantly insisted Paula Deen should not have been fired “just for using that word” was from Iowa. And in a bar in Aitkin, MN we overheard a man discuss n*****s and “A-rabs” and then, hilariously, go on to discuss “those southern hicks.” Kettle, meet pot. We met some Brits doing the trip who mentioned that while in Minnesota a number of people told them that right here are the nicest people they’re going to come across on the trip, strongly implying that as they moved south people were going to get meaner. There’s a lot that you can say about the South, but the one thing you really can’t say is the people are unfriendly toward strangers. I generally have nothing but pride in my home state, but this sort of northern exceptionalism is not a good look, Minnesota. Plenty of people have made jokes referencing the movie, most of them good-natured, which I don’t mind. But a handful of people seem to be using Deliverance as the basis of their understanding of what camping in the South is like. Firstly, Deliverance is not a documentary; it’s based on a novel. Secondly, it takes place in Georgia, which is three whole states away from where we are. And we don’t have stats on instances of canoers being gang-raped by deranged hicks, but I would hazard to guess that they’re about the same in all regions of the nation. 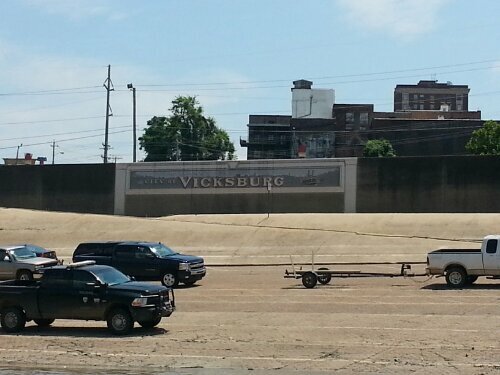 Today we got to Vicksburg, site of the famous Civil War battle, a city that can only be reached via canoe by paddling one mile up the Yazoo River. 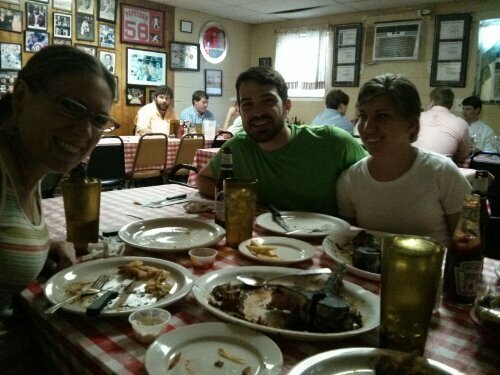 Earlier this week a couple friends of a friend, Philip and Rebekah, picked us up in Greenville, MS to help us resupply, so we treated them to one of the best steaks in America at Doe’s Eat Place. Even more excitingly, we finally entered our tenth and final state, Louisiana. 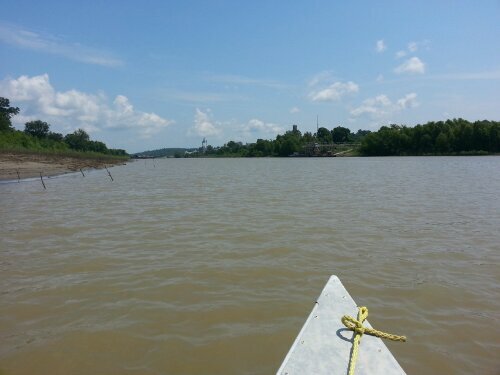 A transition that is marked with no visual fanfare on the river, so we only noticed because I happened to be looking at the map. Hard to believe we’re so close to the end of this trip. Also amazing to think that “almost done” means we have hundreds of miles to go. This entry was posted in Louisiana, Mississippi by Linnea. Bookmark the permalink. Great, insightful observations. I don’t generally think anyone group of people are exceptional or better than others. But there are something about people you meet along the river, north and south. They are all unique and the river binds them together where they know it or not. Keep paddlin’! I’d expand that to all rivers everywhere – something about the serenity and timeless flow makes everyone open, trusting, and friendly. And I’ve paddled those rivers down in Georgia where Deliverance was set / filmed and folk down there are just the same. But how’d you survive the Georgia hillbillies??? Didn’t meet any backwater hillbillies, just regular southern folk. Splendid article, Linnea. Thank you for the insights and sharing your experiences. You are in the home stretch! Keep the essays, articles, insights, and commentary coming. We’re all intrigued. You have so much ahead of you – Mama’s kitchen and Po’Boys, crawfish, Chicory coffee and beignets at Cafe du Mond, the Square, send pics from the garden district, and New Orleans brass jazz bands, the french quarter and Bourbon St., and the House of Blues Sunday Gospel Brunch! That some of the best motivation I’ve gotten while! what a wonderful read!! Do you do this in your professional life “Mrs. D Blaze to be”? if not, you should! this should be a show on the travel network or that new esquire channel coming out in September. i appreciate your neutrality and unbiased approach/opinions. although deliverance did cross my mind… i figure you two have enough NY/Brooklyn in you to “head that off at the pass’ lol!!! But seriously though, it’s been a pleasure reading your blog posts and living vicariously through you two!!! Happy travels and see you soon! Thanks so much! I’ll see what I can do about a show. Oh hey Philip and Rebekah! Oh jeez. We’ll fix the spelling of their names. I just laughed so hard at that. That’s an amazing/terrifying story. YAZOO! So happy to see an update! 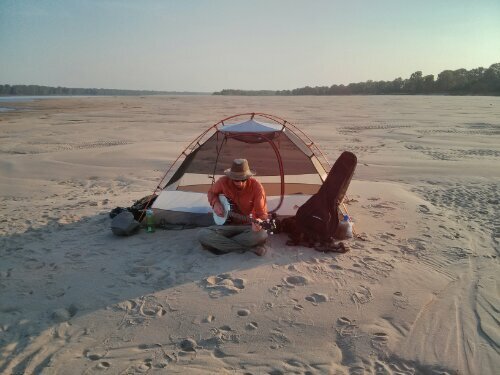 Beautiful sand beach, and banjo playing, and Australian dude. Ha, I always feel like our pictures are meh, so thank you.